Malaysia’s acting Transport Minister Hishammuddin Tun Hussein speaks during a news conference about the missing Malaysia Airlines flight MH370, at Kuala Lumpur International Airport March 14, 2014. An investigation into the disappearance of a Malaysia Airlines jetliner is focusing more on a suspicion of foul play, as evidence suggests it was diverted hundreds of miles off course, sources familiar with the Malaysian probe said. In a far more detailed description of military radar plotting than has been publicly revealed, two sources told Reuters an unidentified aircraft that investigators suspect was missing Flight MH370 appeared to be following a commonly used navigational route when it was last spotted early on Saturday, northwest of Malaysia. That course – headed into the Andaman Sea and towards the Bay of Bengal in the Indian Ocean – could only have been set deliberately, either by flying the Boeing 777-200ER jet manually or by programming the auto-pilot. A third investigative source said inquiries were focusing more on the theory that someone who knew how to fly a plane deliberately diverted the flight hundreds of miles off its scheduled course from Kuala Lumpur to Beijing. “What we can say is we are looking at sabotage, with hijack still on the cards,” said the source, a senior Malaysian police official. One of the most baffling mysteries in the history of modern aviation remains unsolved after nearly a week. 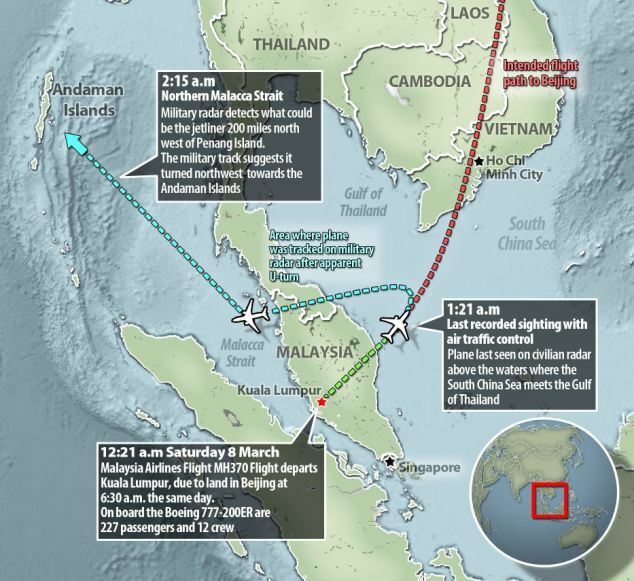 The latest radar evidence is consistent with the expansion of the search for the aircraft to the west of Malaysia. There has been no trace of the plane nor any sign of wreckage as the navies and military aircraft of more than a dozen countries scour the seas across Southeast Asia. Investigators were still looking at “four or five” possibilities, including a diversion that was intentional or under duress, or an explosion, he said. Police would search the pilot’s home if necessary and were still investigating all 239 passengers and crew on the plane, he added. If the jetliner did stray into the Indian Ocean, a vast expanse with depths of more than 7,000 metres (23,000 feet), the task faced by searchers would become dramatically more difficult. Winds and currents could shift any surface debris tens of nautical miles within hours, dramatically widening the search area with each passing day. “Ships alone are not going to get you that coverage, helicopters are barely going to make a dent in it and only a few countries fly P-3s (long-range search aircraft),” William Marks, spokesman for the U.S. Seventh Fleet, told Reuters. The U.S. Navy was sending an advanced P-8A Poseidon plane to help search the Strait of Malacca, a busy sealane separating the Malay Peninsula from the Indonesian island of Sumatra. It had already deployed a Navy P-3 Orion aircraft to those waters. U.S. defence officials told Reuters that the U.S. Navy guided-missile destroyer, USS Kidd, was heading to the Strait of Malacca, answering a request from the Malaysian government. The Kidd had been searching the areas south of the Gulf of Thailand, along with the destroyer USS Pinckney. Satellites picked up faint electronic pulses from the aircraft after it went missing on Saturday, but the signals gave no immediate information about where the jet was heading and little else about its fate, two sources close to the investigation said on Thursday. U.S. experts are still examining the data to see if any information about its last location could be extracted, a source close to the investigation told Reuters. Malaysia’s civil aviation chief confirmed on Friday the government was working with U.S. investigators to establish if there was any satellite information that could help locate the airliner. The last sighting of the aircraft on civilian radar screens came shortly before 1:30 a.m. on Saturday, less than an hour after take-off. It was flying as scheduled across the mouth of the Gulf of Thailand on the eastern side of peninsular Malaysia, heading towards Beijing. However, Malaysia’s air force chief said on Wednesday that an aircraft that could have been the missing plane was plotted on military radar at 2:15 a.m., 200 miles (320 km) northwest of Penang Island off Malaysia’s west coast. This position marks the limit of Malaysia’s military radar in that part of the country, a fourth source familiar with the investigation told Reuters. Malaysia says it has asked neighbouring countries for their radar data, but has not confirmed receiving the information. 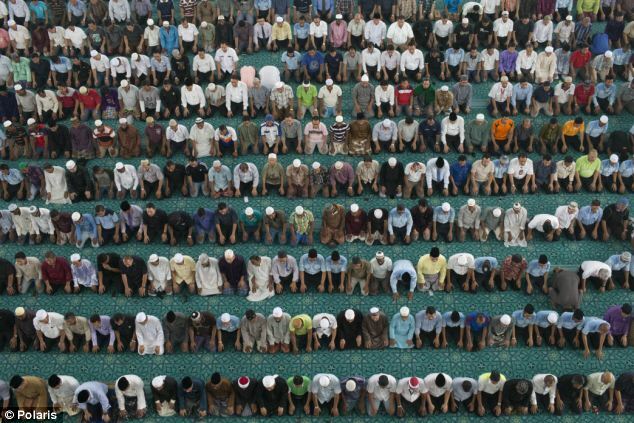 Indonesian and Thai authorities said on Friday they had not received an official request for such data from Malaysia. The fact that the plane – if it was MH370 – had lost contact with air traffic control and was invisible to civilian radar suggested someone on board had turned off its communication systems, the first two sources said. They also gave new details on the direction in which the unidentified aircraft was heading – following aviation corridors identified on maps used by pilots as N571 and P628 – routes taken by commercial planes flying from Southeast Asia to the Middle East or Europe. Hishammuddin said it remained unclear if that aircraft was MH370. “We need to get verification and we are working very closely with the experts,” he said. An already difficult search task has been complicated in some areas by a choking haze caused by burning forest and farmland that has enveloped much of Malaysia and spilled into the Strait of Malacca. The haze, exacerbated by a prolonged dry spell, has reached hazardous levels in several spots. India had deployed ships, planes and helicopters from the remote, forested and mostly uninhabited Andaman and Nicobar Islands, at the juncture of the Bay of Bengal and the Andaman Sea, military spokesman Harmeet Singh said on Friday. The Indian Defence Ministry said the Eastern Naval Command would also search across a new area measuring 15 km by 600 km along the Chennai coast in the Bay of Bengal. 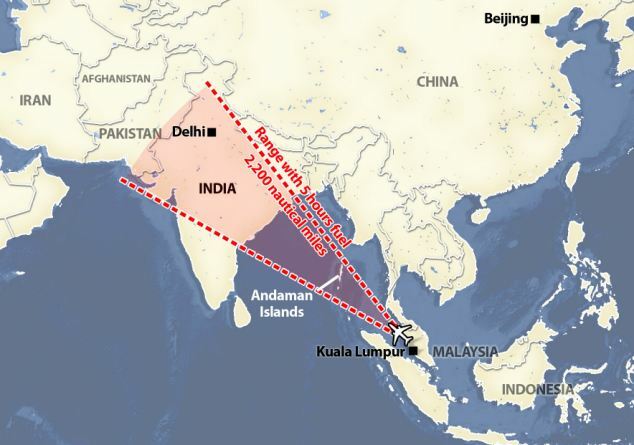 The shape of this area, located 900 km west of Port Blair, capital of the islands, suggested the search was focusing on a narrow flight corridor. China, which had more than 150 citizens on board the missing plane, has deployed four warships, four coastguard vessels, eight aircraft and trained 10 satellites on a wide search area. Chinese media have described the ship deployment as the largest Chinese rescue fleet ever assembled. The Boeing 777 has one of the best safety records of any commercial aircraft in service. Its only previous fatal crash came on July 6 last year when Asiana Airlines Flight 214 struck a seawall with its undercarriage on landing in San Francisco. Three people died. Posted on 14th March 2014 by newsafrica. This entry was posted in Human Rights Violations, Malaysia Airlines flight MH370 DISAPPEARANCE and tagged Andaman Islands, Hishammuddin Hussein, Indian Ocean, Kuala Lumpur, Malacca Strait, Malay Peninsula, Malaysia, Malaysia Airline. Bookmark the permalink.